In the second installment of our Meet the Neighbours series, we’re happy to introduce you to Amber and Matt. They’re in the process of building a custom home here in the river valley and we can’t wait to welcome them home to Sarilia! Matthew and I both grew up in Saskatoon. What was it about Sarilia that made you decide to buy a lot and build your home here? So many things! First of all, the beauty of the place. The landscape is such a wonderful mix of prairie, hills, treed lots, and then the river. Having grown up in the city, and always having loved the access the city provides to entertainment, shopping, restaurants, etc., it was going to take a very special place to get me to build outside the city. To me, Sarilia provides the peace and beauty that comes from country living, but with the community and neighbours that protects from that feeling of isolation I think I would have on an acreage. Also, Matthew and I were not looking for a property that required the type of upkeep that some country/rural lots require, considering that we both work. On top of this, we feel that it is close enough to the city that we can handle the commute quite easily. In fact, I find that the drive out to Sarilia after a long day at work helps me to unwind and relax. The cost of the lots at Sarilia compared to how much lots cost in the city means that we can build a home that we’ll love, and not have to sacrifice because of an expensive lot. Another major reason was that when we visit, we feel a real sense of community. We can’t wait to finally move out there and meet all of the neighbours. We are building with a company called CNS Developments, who is doing a custom build with us. Curtis Mann, the builder, has been amazing and very accommodating. We’re very happy with him. What are you most looking forward to about living in the river valley? Waking up every day surrounded by such beauty! Matthew and I really value our downtime outside and our time with friends and family. I can’t wait to entertain out on our deck with the sun setting over the river valley! We currently don’t have children, but I can’t wait to one day raise our children out there. I love the idea of kids being able to play outside in the woods and the fields, discovering nature or wandering around and riding their bikes with the other kids in the neighbourhood and not having to worry about busy streets. I love that we’re going to live in a community where we know everyone. What activities do you both enjoy? We love riding our bikes and going for walks. I love to cook and bake. Right now I have summers off because I work in the school system, so I spend as much time as I can up at our family’s cabin at Nesslin Lake where we fish or just go out on the boat. Other than that, on weekends we spend a lot of time socializing with friends and family. Every Sunday we get together for supper with my family. I can’t wait to be able to host and have them out to our new home. I’m a counsellor in the school division, which is a new job since I graduated with a master’s degree from the U of S. Two things that I never thought I would do in my life would certainly be working in the school system and living in the country, and I couldn’t be more thrilled that last year brought both of those things into my life! Matthew and I have also made a promise to ourselves that we will make travel a priority in our lives. 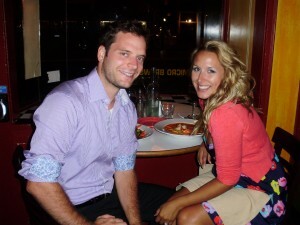 My favourite trip that we have gone on is our honeymoon, where we flew to Portland and then rented a car and took a road trip along the Pacific Coast Highway for two weeks, ending in San Francisco. When we give tours of Sarilia, people often ask, “Who lives here?” and “Who will my neighbours be?” It’s an important question. When you move to a new community, you want to know if there will be someone to walk the dog with, to share a glass of wine with, or go canoeing with. Perhaps you want to know if there will be other kids for your children to play with. With that in mind, we’d like to introduce you to some our (soon-to-be) newest neighbours at Sarilia over the next few weeks. 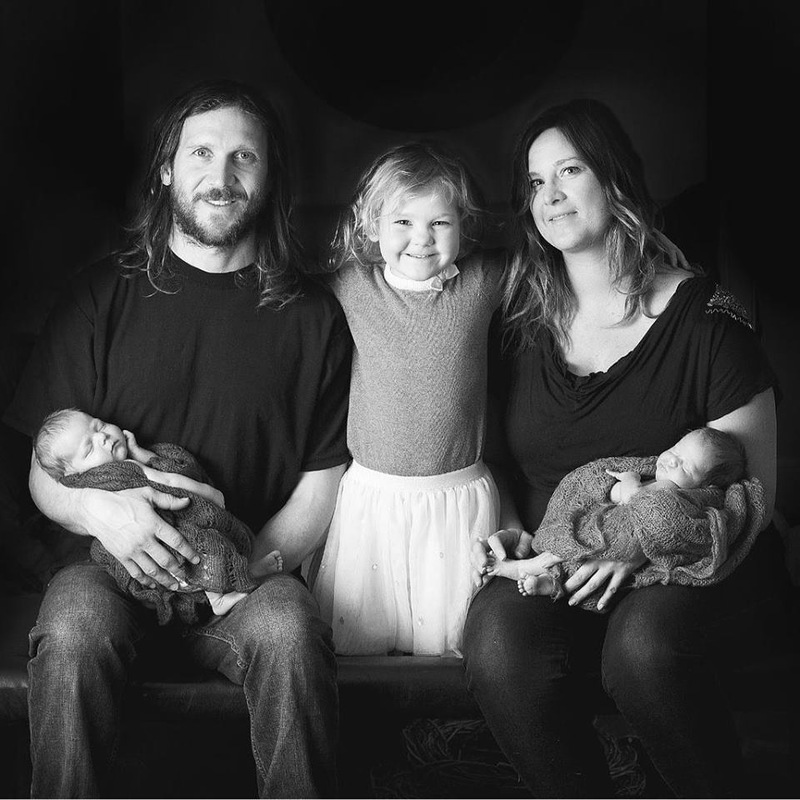 This week, we’re starting with Georgie and Jared and their three adorable children. A BIG thanks to Georgie for taking the time to answer our questions! What was it that made you decide to start looking for a new place to live? Our family had grown bigger after the arrival of our twin boys. We decided that we were going to outgrow our current home. We were looking for land outside the city and a friend of ours said she was building in Sarilia, so later that week we found the website and fell in love. We decided to go for a drive and immediately knew it was where we needed to be. Our hearts grew with excitement and peace driving around looking for our perfect lot. My husband and I are from Saskatoon and we grew up in Riverside Estates. We are both very drawn to the river valley for that reason. Sarilia offers the serene peace of the valley but in an affordable price range not too far from the city. From the moment we drove down into the Valley and started taking in the views we got goose bumps! We had permanent smiles plastered on our faces driving around. There was such a positive energy flowing in the area. My husband and I were looking for somewhere to call home that would be a great environment for our children to grow up in. I could just see the kids skipping rocks on the river banks like I did as a child. Family hikes and canoe rides after supper and roasting marshmallows by the fire. It was just the perfect place with lots of space for our family to make many amazing memories. The fact that we wouldn’t have to really worry about amenities also helped us with our decision. The power and gas are there and the water and sewer (septic) services too. We are very green-minded people so we are happy about the constant guidance to be responsible for what you use from the land. We decided to build an RTM (ready-to-move). We went with J&H Builders and found a floor plan that suited our family’s needs. The windows on the home we are building will really capture the amazing river valley views! Being close to water and just having the space. Being able to go for a paddle board in the morning or after supper. I love the layout of the Estates for going on morning jogs and walks. We are looking forward to the fresh air, green views and sounds of wildlife. What activities do you enjoy? What do you do in your spare time? I’m a mom so when I DO have spare time it’s usually knitting. 🙂 I love spending time with my family and friends too. I enjoy light jogging and paddle boarding. My husband enjoys golfing, fishing, water-skiing, paddle boarding, swimming, cross-country skiing, snowboarding – pretty much anything active and outdoors! We are fairly simple people as long as we are getting enough fresh air and healthy food we are happy. We enjoy our time together making memories! Our daughter, Bennett, is an amazing swimmer and has been swimming without a life jacket or water wings since she was 2.5 years old. So, to encourage her love of the water we spend lots of time at the lake in the summer and at the indoor pools in our parents’ houses in the winter. Our little twin boys, Kyver and Bodhi are growing up so fast and are all about smiling right now! They’re four months old already and keeping momma busy. My husband’s parents have a place in Palm Springs we go to for two weeks every spring! It’s our little get away to shake off the last leg of winter. It has very quickly become our favourite destination with the family. 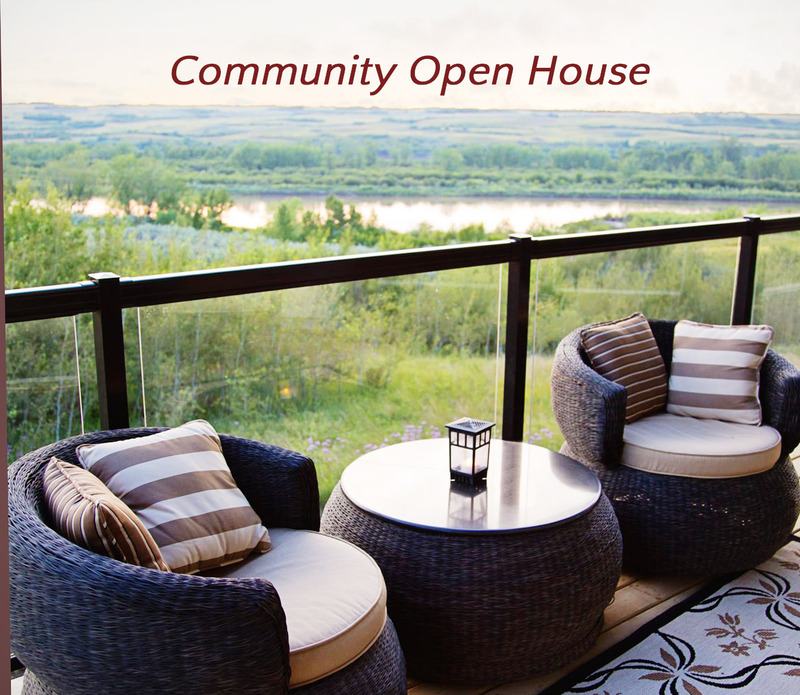 Join us this Sunday, August 10 between 2-5 pm for a tour of Sarilia’s community. You’ll meet the developers, Gwen and Ronn, who’ve made the river valley their home. You’ll also get an opportunity to look at available lots and potential house plans that would suit your lifestyle. Just bring yourselves and your curiosity. We’ll bring the refreshments and the sunshine!